Don’t put that slow cooker away for the summer. 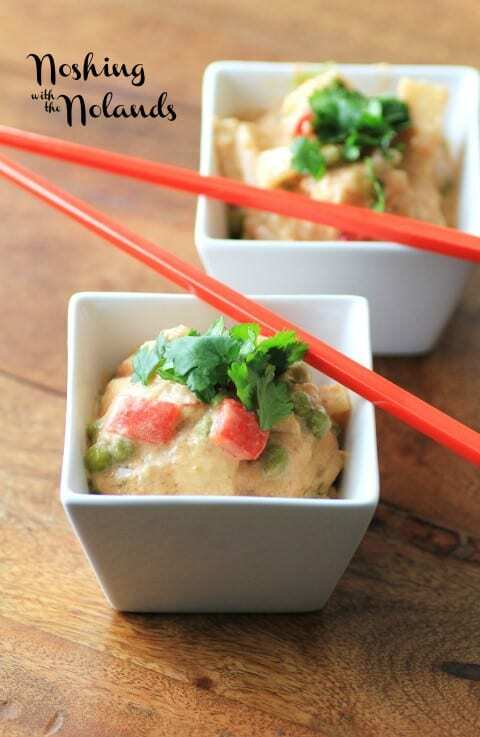 There are lots of great lighter fair recipes that you can make that also won’t heat up the kitchen, like this Thai Coconut Fish Curry. 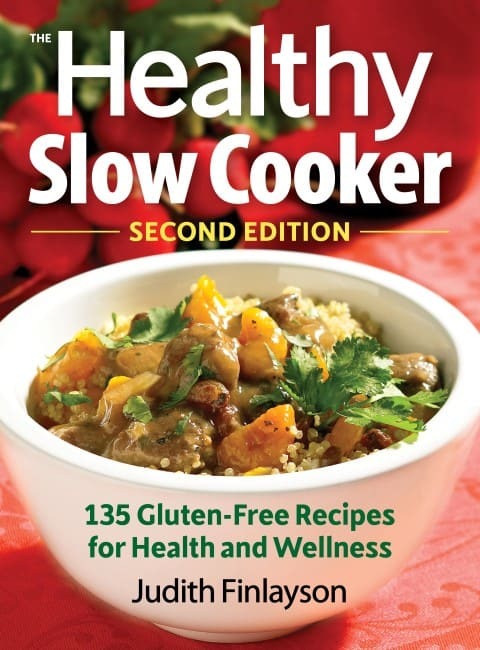 The cookbook we have for you today is The Healthy Slow Cooker, 135 Gluten-Free Recipes for Health and Wellness by Judith Finlayson and when you are tired of BBQ pull that slow cooker back out!! I choose this recipe as it was very simple and I love the flavors of Thai. At the last moment most of the ingredients are added and cooked giving you a delicious and easy Thai meal. Each recipe in this cookbook features a detailed nutritional analysis. There are sections throughout the cookbook called Natural Wonders that contain information on diet and health, a gorgeous and informative read from cover to cover. There are well photographed pictures throughout highlighting scrumptious recipes like Creamy Morning Millet with Apples or Sumptuous Spinach and Artichoke Dip or Shrimp and Grits or Syracuse Sauce. All done in the slow cooker, all done gluten free and lightened up. I will be making more from this cookbook for sure!! Judith Finlayson has enjoyed a long career as an author and journalist. She then turned her focus to cookbook writing including The Healthy Slow Cooker, 175 Essential Slow Cooker Classics, Slow Cooker Comfort Food, and The Vegetarian Slow Cooker, and they have sold more than 750,000 copies. 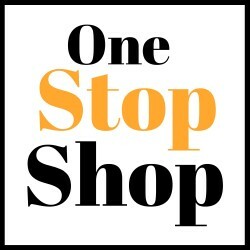 Thousands of people have enjoyed Judith’s slow cooker cookbooks finding out how delicious and convenient your meals can be. Judith resides in Toronto, Ontario with her husband and daughter. She writes about this recipe: This luscious dish has everything going for it: a centerpiece of succulent fish, a sauce of creamy coconut accented with zesty Asian flavors and an abundance of tasty vegetables to complement the mix. Serve this over brown basmati rice to add nutrients and fiber and complete the meal. 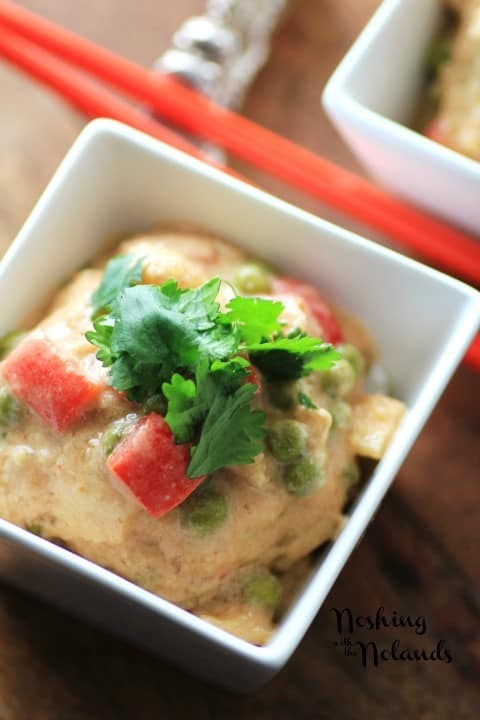 An easy Thai dish done in the slow cooker that would be great anytime of the year!! In a skillet, heat oil over medium heat. Add onions and cook, stirring, until softened, about 3 minutes. Add garlic, ginger and lime zest and cook, stirring, for 1 minute. Add vegetable and fish stock and stir well. Transfer to slow cooker stoneware. Cover and cook on Low for 6 hours or on High for 3 hours. In a bowl, combine lime juice and curry paste. Add to slow cooker stoneware and stir well. Stir in coconut milk, fish sauce, fish, bamboo shoots, green peas and red pepper. Cover and cook on High for 20 to 30 minutes, until fish flakes easily when pierced with a fork and mixture is hot. Garnish with cilantro and toasted sesame seeds, if using. Check the label to make sure your curry paste does not contain unwanted additives, such as gluten. Recipe Courtesy of The Healthy Slow Cooker, Second Edition by Judith Finlayson © 2014 www.robertrose.ca Reprinted with publisher permission. 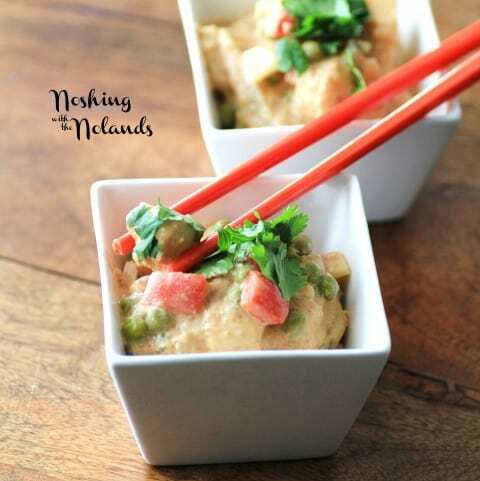 I love Thai curries, and this one looks amazing! Love the book review too. Tara, I’m in love with this recipe! Your curry turned out perfectly – it looks delicious! I love making curries, especially since it’s a great way to use up any leftover veggies in the fridge. I’ve never made one with fish so this will be on my must-make list for the summer. This time of year, my slow cooker STAYS on the counter! We use it so much! This is a fabulous (and gorgeous) slow cooker recipe! Thank you!